This weekend was Grand Prix New York! This Grand Prix was significant for a number of reasons: it marked Magic’s triumphant return to New York City (or at least the tri-state area); it was ChannelFireball’s first GP on the East Coast; and it was the first Grand Prix in the Northeast region in nearly half a year. But the event was especially significant for me, because it was the first time I’ve judged a Grand Prix in the same place I’ve been living. Rather than yet again being a guest in someone else’s backyard, this time I had the privilege of welcoming everyone to my city. That was truly special. All joking aside, I quite enjoyed Eldritch Horror, which is a cooperative board game set in Lovecraft’s Cthulhu mythos. Players take the role of investigators striving to unravel the mysteries behind the madness and monsters that are spreading across the world. 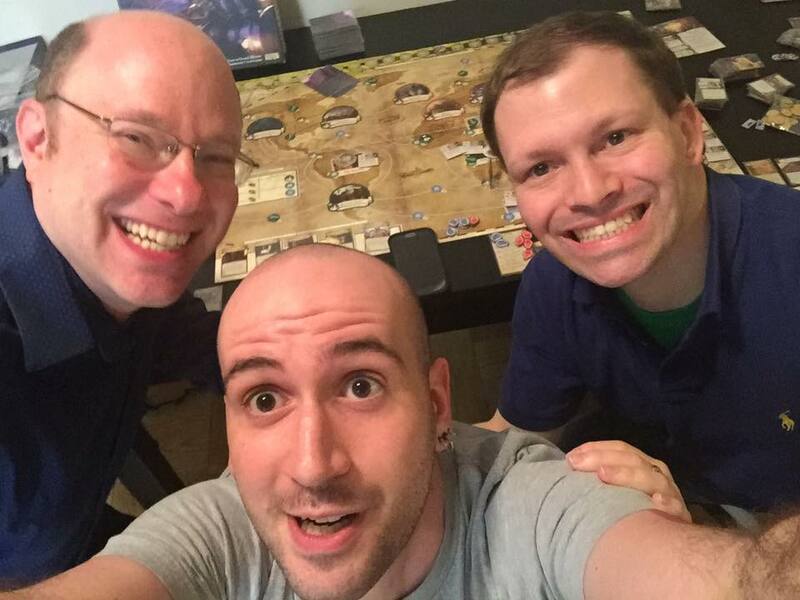 Alas, Steven and I were not quite up to the task, as during our Las Vegas game, Dread Cthulhu arose from the sea and drove us mad, sealing the fate of the world…at least for that playthrough. Thankfully, Steven was eager to try again, and asked if Mani and I were interested in playing with him before the GP. Of course, I said yes, and so the three of us gathered in my apartment on Thursday for a fresh crack at the game. Although we players devoured delicious sushi, we handily prevented Azathoth, Lord of All Things, from devouring us. With the game won and the world saved, it was time to run a GP. Although I had initially planned on sleeping in my own bed over the weekend (as a point of personal pride if nothing else), practicality eventually won out. As a member of CFB’s Core team, part of my compensation for the weekend included a hotel room or equivalent per diem. With an extended shift on Saturday looming, and the transit from my apartment to the venue likely to take about an hour each way, it simply made sense to take the hotel room. And since Steven was also a Core team member, that meant we were leaving for the same place! So after I hurriedly packed some things, Steven and I hopped in a taxi to Penn Station, then took the train across the river into New Jersey. A quick Uber ride later, we were at the hotel, steps away from the venue. …or so I had thought. I had planned on meeting Steven for breakfast around 8, but by the time 8am rolled around, I was convinced I wouldn’t be well enough for my 1pm shift, let alone joining Steven for a meal. Thankfully, Steven heard my plaintive cry for help and brought me some delicious life-saving yogurt and apple juice. After managing to keep that all down, I decided to, instead of calling out sick, nap for another few hours and see how I felt around noon. Skip ahead a few hours, and I felt…well, still not great. But well enough to judge. I hopped in the shower and suited up. Thankfully enough, Friday was my “easy” day: I was part of Scott Neiwert ‘s scheduled sides team, but had no formal leadership responsibilities, not even head judging one of the events. Instead, Scott gave me a neat assignment: help launch events, and give feedback about the start of each event to that event’s head judge. Hey, I could do that! Overall things went quite smoothly. To be honest we were probably a little over-staffed, and it wouldn’t have been a big deal if I’d skipped my shift. Nonetheless, I enjoyed my role and I think I gave a few judges some good feedback for the future (especially on being heard during their opening announcements). I should also add that I told Scott I had been feeling ill, and he was very accommodating and understanding. The biggest and most complicated event I helped start was Friday’s Foiled Again, which is basically the Grand Prix version of Friday Night Magic. Unlike other events on Friday, players got a lot of stuff for playing in Foiled Again: a playmat, a Blighted Fen promo, and six packs to play Sealed with. Oh, and it had over a hundred players. These logistical issues are all eminently solvable, and indeed, we had more than enough product/playmats/promos ready, so the hardest part was already taken care of — leaving only the task of actually handing out all that stuff. And that, too, went pretty smoothly. My big tip for anyone who head judges this (or a similar) event in the future is to give more explicit assignments about which set of players each judge should be responsible for handling things out to, which, at least in my opinion, helps speed up the process and reduce confusion among judges. Foiled Again also gave me the opportunity to grab a bunch of blank inserts from the remnants of the FNM promo packaging. These inserts make great tokens, so I always pick them up when I can. The last notable event from Friday was bumping into a couple people from Wizards who wanted to talk to me. The first of these was Hélène Bergeot, who asked me about appropriate terms for gender-neutral bathrooms. The second person was Marc Calderaro from Wizards’ Coverage Team, who wanted to talk about decklists for the main event tomorrow, as I was co-leading the Deck Checks team. Both conversations were enlightening and important, but on entirely different axes. I really appreciated that Hélène took the effort to ask about the right language to use at Magic events. While I was unable to answer Hélène’s question myself, I knew that Amanda Stevens was at the event, and that she would have a great answer. Amanda told me that, besides “gender-neutral”, other potential adjectives are “single-occupancy”, “family”, or “generic.” Of these, Amanda told me that “single-occupancy” is generally regarded as the best and the most welcoming, as it simply states something that is true about the bathroom, without emphasizing who is allowed or “supposed” to use it. Happily, Hélène was very receptive to all of this, and I’m optimistic about what this means for future Grand Prix. As for Marc, it was great to sync up with him before the main event had actually started. Beyond the Deck Checks team itself, Wizards Coverage is the biggest consumer of the collected decklists, and because many of the players’ decklists get published online these days (not to mention referenced on coverage), the tolerance for error is basically zero. Beyond explaining what he would need during the day and at the end of it, Marc also had some helpful suggestions for managing the sleep-in-special lists, which I appreciated. I’m grateful Marc went out of his way to reach out! All in all, Thursday and Friday were a fantastic start to the Grand Prix weekend — and things only got better from there. From the main event to the Super Sunday Series, I had a ton of fun, met great new people, learned a lot, took some interesting calls, and overall had an absolute blast. Check back next week for the rest of the story! Click here to read about my adventures on Saturday of the Grand Prix! Oh I want to play Eldritch Horror with you some time! Don’t worry about Cthulhu eating the world however, it can be super tough some times. I also seem to recall that 3 player games are drastically more difficult than 4 player games….